We recently partnered with Farah Merhi of Inspire Me! Home Decor for a complete backyard makeover. Farah chose a variety of POLYWOOD furniture collections to curate a sophisticated and coordinated look, creating a beautiful outdoor sanctuary that feels like you’re in a home. Summers are short in Farah's hometown in Michigan, and when the temperature gets warm she wanted to take advantage of her outdoor space. Her vision was to bring the indoors, outdoors — to reflect how she designed her indoor space and create a relaxing spot for her family to enjoy together day-to-day, but also accommodate entertaining friends and family. 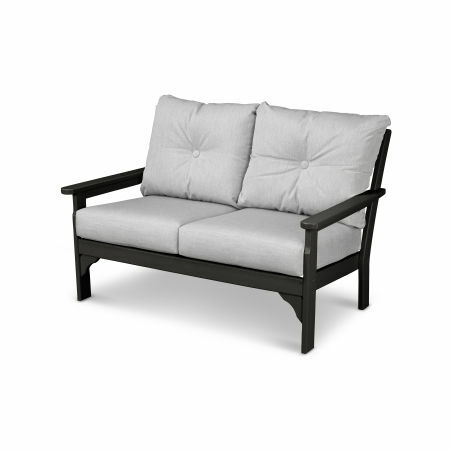 When it came time to select furniture, Farah faced furnishing multiple outdoor seating areas. Each space would have their own unique function: outdoor living room, outdoor dining room, firepit, and a space under the deck. She wanted each area to complement one another and tie back to each piece selected to create an overall cohesive look. 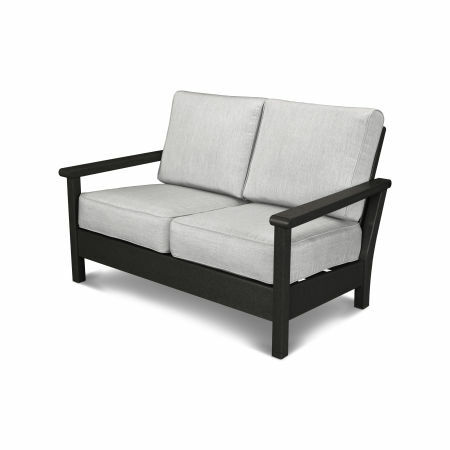 "I've experienced buying outdoor furniture that had to be thrown out after just a few seasons of harsh Michigan weather. 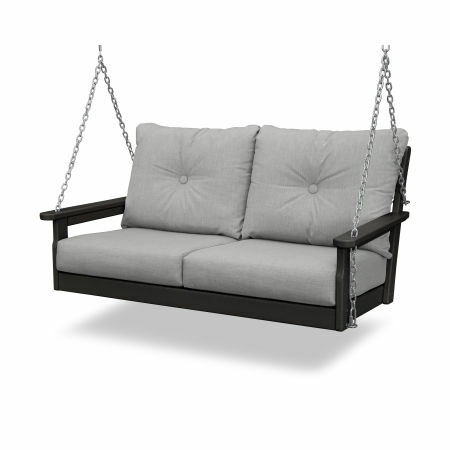 I knew I needed furniture that would truly withstand the elements this time, but that still had visual appeal. POLYWOOD checked both of those boxes." Harbour Deep Seating was chosen for Farah's outdoor fireplace area to create a cozy spot to relax and warm up on cooler Michigan evenings. Geometric patterns in pink and black complement the contemporary lines of the Harbour Collection. Farah incorporated some of her own Inspire Me! Decor accessories throughout each outdoor area with metallic gold and silver touches. 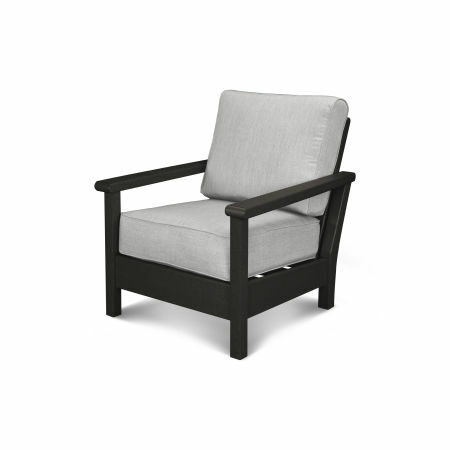 Black lumber with Granite cushions is such a classic look that will never go out of style. Pillows and blankets were the perfect way to add a pop of color that can easily be swapped out later on when Farah wants a fresh look. Our Chippendale Dining Chairs blend traditional and contemporary style while complementing the clean lines of the Harbour Deep Seating situated nearby. Farah chose matching Granite seat cushions for her dining set which add a contrasting color as well as extra comfort for her guests. 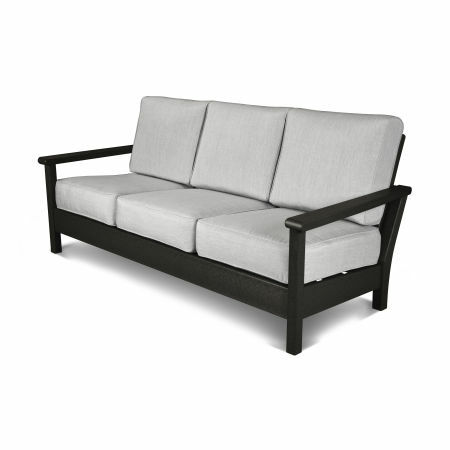 POLYWOOD cushions are covered in durable outdoor quality fabric that resists weather, salt, sun, mold, and mildew. For her built-in bar space, Farah chose Vineyard Bar Arm Chairs which feature a relaxed, subtly curved back, contoured seat, and footrest. 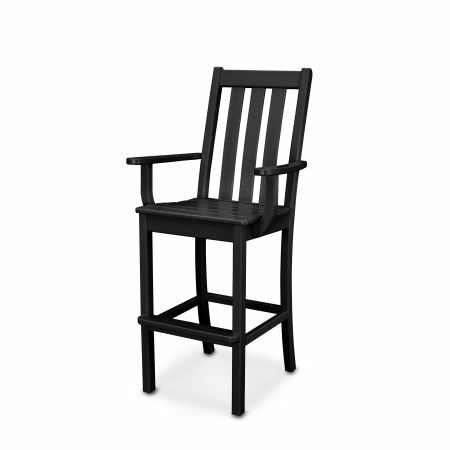 What's better than the comfort of a deep seating rocking chair surrounding the warmth of a firepit? If you have a flat patio area around your backyard firepit, like Farah, don't rule out rocking chairs as a seating option. 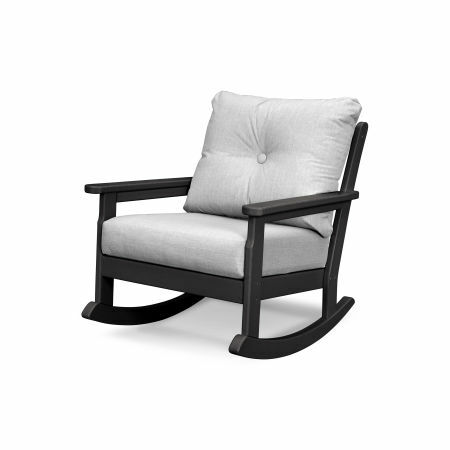 Farah chose Vineyard Deep Seating Rocking Chairs for her space, featuring pillow-back cushions covered in durable and quick-drying Sunbrella® fabric. The space under Farah's deck was unique in that it was a long narrow space — the perfect spot to install a couple of Vineyard Deep Seating Swings.